This coming Saturday is the due date. (If only human's due dates were so certain, lol!). I was meant to be working my last morning shift that day and managed to swap it so I could supervise (be nosy really, I've never seen chicks hatch in an incubator yet). I'm getting a little nervous - have I kept the temperature right? Have I kept the humidity right? What if I've stuffed it all up? I candled them on day 7 and on day 9 and ended up throwing away four that I was certain were infertile. I cracked them open gingerly to confirm and I had got it right for all four. That makes me a little (just a little) more confident. So much easier with a broody chook, you can blame it all on her if it goes wrong! Speaking of broody's, I have two hens sitting on clutches now. The neighbour's hen (her one and only surviving) and Fidget, my lavender Araucana. We wait with bated breath. 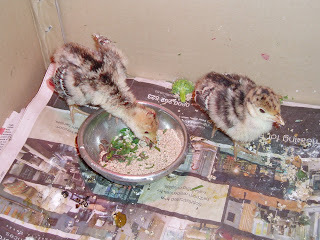 I have two little turkey poults in my brooder box. My hubby whipped a large one up out of plywood the other day in preperation for the chicks, but it's getting a trial by turkey first. I had trouble getting these guys to eat at first (they were wild poults) but give them a moving target and they're on to it! That's a slater going down the hatch I think. And it pays not to get too engrossed in other people's blogs. All was quiet, too quiet. No more sticky labels left. "Stripey!" She said. 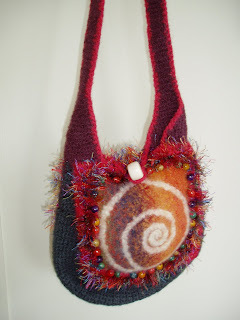 I know that it's Friday, I do, I'm just annoyed that yet again I've missed WIP Wednesday. I always have good intentions. I think about it, sometimes I even snap what I'm doing, and then before I know it, it's Friday and I've missed WIPW again. So here is a terrible photo on a Friday instead. 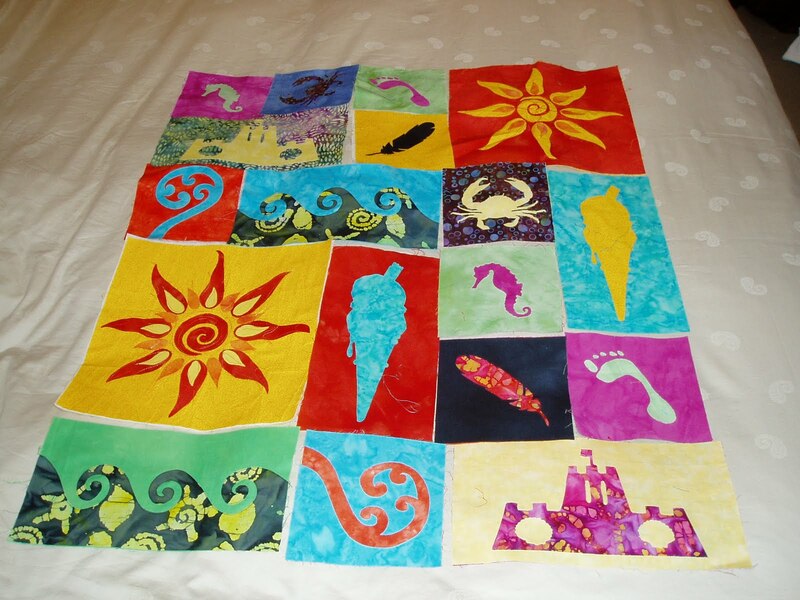 This is a little quilt I'm working on for a new baby who I haven't met. Last night I sewed all the blocks together so it's even further on its way to completion. The other things I'm working on can't be shown here because they are Christmas gifts or swaps for fellow bloggers - can't spoil a surprise! Rumpelsteakskin. He's finished his milk and now nibbling on a little meal, but he'd rather have more milk please. 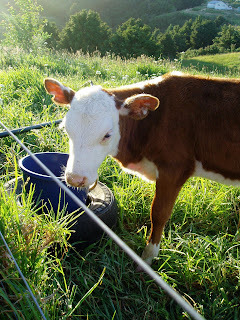 Henrietta Hereford Hamburger, who has always shunned my attentions. She's really only hanging around because her mates think I'm alright. Oh, and there's calf meal on the offing. I’ve spent this afternoon thinking. In an abstract, distracted kinda way. Whilst aimlessly wandering around doing a little tidying, a little cooking, a little rejoicing that my daughter seems to be coming right after the last few days of vomiting. How did I sleep through this? It’s probably been brought on by the massive earthmoving endeavors of yesterday. They represented a major step forward in the development of this piece of land. It got me reflecting on what I actually want, where I want to head with my life, which, of course, has a lot to do with what I want to do with this block of land. My husband owns one business and ½ owns another. The first business he bought as a one-man band operation and has built it up over the last six years to the point where he has put in a manager and stepped away. He now works in the other business and they are slowly building that one up. He periodically contemplates selling the first business, but vacillates because it gives him a decent drawing every week though it still causes him stress (admittedly a whole lot less now he has a manager). Now he is thinking about selling it again and using the profit towards a property of some description. Stainless steel work my husband has done. I am hesitant because it is the drawing that really has allowed me to resign from work myself. And I resigned in part to spend time on THIS property, planting an orchard, tending a large vege garden, raising animals and homemaking. 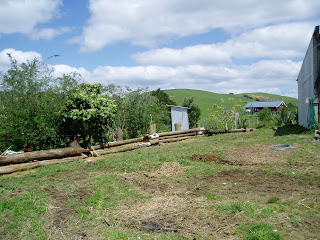 Yet his plans for another block of land could either mean uprooting us from here, renting it out and starting again somewhere else, or running some sort of stock raising system that would see our weekends taken up with visiting and overseeing the other block. However, new challenges always excite me. I think I’m very good at starting things, getting enthusiastic about things, but not necessarily following them through to the nitty gritty end. And I guess I’m a bit at that stage here. I have big plans for this place but the next few steps are hard work and I won’t really start to see rewards from here for a while. So it would be easy (in a way, because uprooting is never very easy) to be diverted by starting a new project. I think just writing this is making me see it a whole lot clearer. I need to convince my husband that whether or not he sells his business, we need to get this place up and running before we move on or consider more challenges. They're gorgeous when they're happy. And all the while, done the other things that you do, like work, sleep, quilt, plan birthday parties, cook, nurse sick kids, walk dogs etc. I guess what I’m trying to say to myself is, hey! Go easy, you’ve actually done quite a bit and even though you spend a bit of time wandering round aimlessly, you are still achieving things. Whilst you still have plenty to do to get this place to ‘dream lifestyle’ stage, packing it in and starting somewhere else is just going to put you back at square one, don’t give up now! With that sorted out, I guess I need to look more closely at what I (or we!) 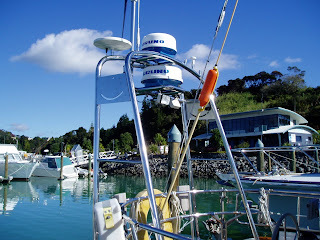 want to achieve out here in the next wee while and do some step-by-step goal setting to help us get there. But I think I’ll save that for another post….. 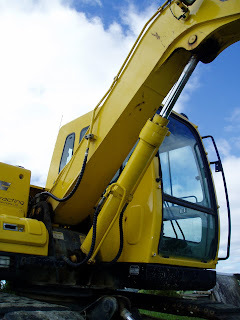 The big yellow machine finally arrived. This has been a much anticipated step towards getting ourselves sorted out here on 'the land'. 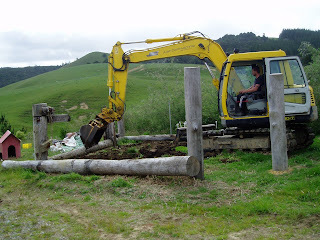 And the digger flattened it all out. They scraped off the topsoil first and put it on top of my garden site. Then they flattened it all off, filling it up with subsoil from the duck pond. This is a 'before' shot of where I wanted a duck pond. There is a drain or swale that runs across the hillside here and so it will now run off naturally into the 'pond'. I think pond doesn't quite encompass the scale of this thing, really it's a dam. Here is an after shot taken from about the same spot, which doesn't even really show it properly. The edges are all tidied up now and I can see I'm going to have to do some serious planting around it and, of course, some sort of fencing. I didn't intend a dam. I wanted a little pond that I could build a duck pen around with a house in the middle and another pen on the other side. Then I could use one pen at a time so that they didn't get completely bogged or bare. But now instead I have a huge dam. And it's ok, because now we have an extra water storage facility for summer. We can use it for the stock water troughs and it will still service the ducks, I'll just have to find a different way to utilise it. The soil level is now about three feet higher than it was. THREE FEET!!! 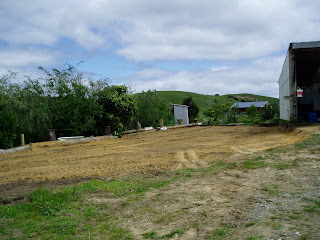 It's all lovely topsoil and loosened by the big yellw digger. The loosening goes down below for another couple of feet too. What would have taken me about 30 hours of hard double digging and then another 40 hours to shift all the topsoil from the shed site, was accomplished in about 30 minutes. It made me gulp to think about the fossil fuels that that beast consumes, but I can rationalise it when I think of the human hours this would have taken. And now the digger has moved over to the neighbours to do some work over there. 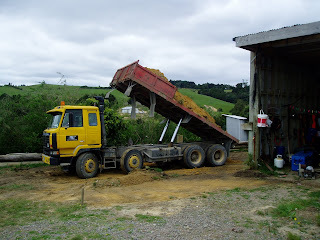 So we saved a bit of fuel by combining the transport costs of trucking the digger out here too. So now I have lots of things to do. I have to find out how to care for dams, what to plant around them, and how to keep them healthy. I also have to fence the garden and start PLANTING!! I'm kinda overwhelmed with the thought of the garden because things have just taken such a giant leap forward, brain has to catch up. So that is it for now. I have the night off tonight but will be caring for a vomity little girl instead. My darling sister, Just This Side of Chaos, sent me this in a parcel. Isn't it gorgeous? 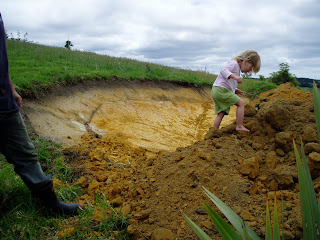 and flatten a second watertank site for us up the top of our hill. I'm so excited by the prospect of a vege garden I almost piddled my pants. Better go to bed so I can get up early enough to take 'before' pics. 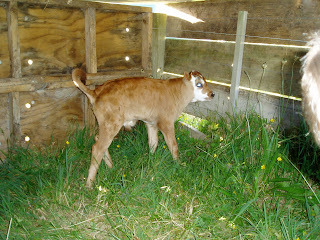 PS all calves are still alive and healthy, feeling quite proud. Please excuse the photo quality but these were taken last evening after feeding. I kinda forgot to take pics and then quickely grabbed some shots before it got too dark. This is Black Pudding having a scratch. She really is the sweetest calf but is pretty keen on her feeds and will push and bunt the others out of her way even though she is the smallest! Poor skinny Gloria. Someone at the saleyards said she looked like she had been taken off milk and needed to go back on and I agree, she needs feeding up. But she takes milk no probs and I've seen her chewing on grass too so I think she'll be ok. You can see Rumpelsteakskin and Black Pudding in the background. In the foreground is Bunty Beef - she also knows how to get the good stuff and I've also seen her chewing on grass, she's definitely a bit older. 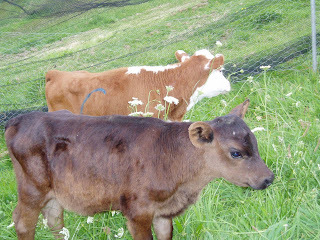 And her penmate at the back is Henrietta Hereford Hamburger. We managed to get her back to the pen by letting out all the others and once she was in a group she settled down immediately. She's still not interested in milk though. I even straddled her, put the teat in her mouth and squirted milk down her throat - not interested! I have seen her urinate and have a grassy poo, and she is probably the best covered of the lot of them so I'm not concerned. So that's our happy little bovine family. 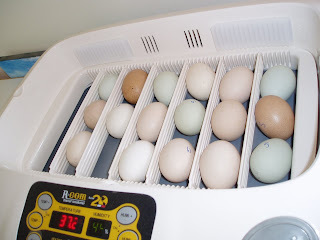 On other farmy news, I have a new incubator and about an hour ago I set 21 eggs in it. Twelve purebreed eggs: Barnevelder, Araucana, Light Sussex, Barred Rock and Faverolle. And nine of my own: Araucana, Dorking, Golden Laced Wyandotte and Orpington all crossed with my Silver Laced Wyandotte Rooster. So in 21 days time, watch this space!! Especially when you come home with some new animals. Henrietta Hereford Hamburger: another slightly older, red and white calf who is currently spending the night out in the cold as she escaped the pen and YOU try tackling a frightened 45kg calf travelling at racehorse speed! 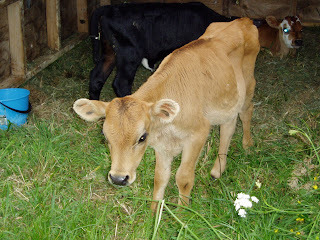 Two of these (we've yet to decide which two) will end up in my friend's paddock. It will probably be the two we can catch at the time (but not Gloria!). Cadi over at Maehegirl, generously awarded me this! 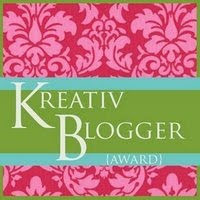 I feel very privileged as I've only been doing this bloggy thing for a little while. So the deal is to copy the award to my blog (tick), link to the award giver (tick), list six things about myself that you may not know and then pass the award onto six others whose blogs I think are deserving of an award (oh, the heady sense of power! ), post links to them and give them a comment telling them I gave them an award. 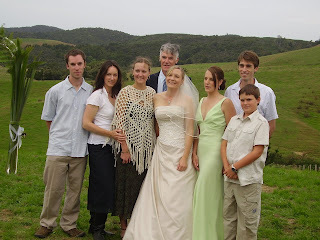 I have three older sisters and two younger brothers and a younger half brother, two step-sisters and a step-brother. People open their eyes wide when I list them all and I feel obliged to qualify it with, "Yes, I grew up in a Catholic family". I don't have too much to do with my step-siblings as we didn't ever really live together and all my other siblings, except one brother, live in Australia. I am very impatient. 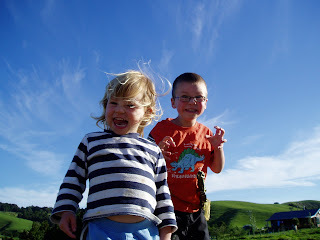 I don't think I am a natural Mum and I have to work hard at parenting and often feel guilty about it all. I love my children dearly but I'm very glad I have access to daycare and I feel very relieved when I find other people who feel the same way. Don't keep chocolate biscuits and me in the same house - I have no self-control. I could never spell neighbour as a kid. Or ingredients, and I have a recipe book that I started when I was about ten and the first six pages have it spelt wrong every time. Which makes me giggle and remember when my sister pointed it out to me. I hate mushrooms. I used to do everything possible as a child to avoid eating them, including secreting them in my hand, going to the loo and flushing them. However, when I accepted a lunch invitation with a client when I was an Independent Midwife, and she served up a bowl of mushroom soup, I managed to swallow the whole lot. The power of politeness! I used to be vegetarian. For quite a few years over my teens and my early twenties. It was never because I didn't like meat but more thoughts about how the animals are treated and killed and how unsustainable meat farming can be. However, my husband is a confirmed meat eater so it became a little harder when I met him and now that we have a chance to grow our own meat, I have no problem with it. I know my animals have a great life, they have a very quick and unexpected (for them) death and I know that my agricultural practices are sustainable. This is a little strange because there are HEAPS of blogs I love, but I tend to be a little bit lurkerish and don't introduce myself or comment much on blogs I follow (maybe that's something I could work on). So for some blog owners this is going to come out of the blue. Plus I know that some of them have a few trillion followers so probably get awards like this all the time (meaning: I won't be offended if they ignore it!). Cat, over on Just This Side of Chaos. She happens to be one of my sisters so I'm a little biased. But I love how she finds time to create simply scrumptious looking cupcakes. And she's not afraid to show a few disasters either. Yay for being human! Jodi, at Ric-Rac. 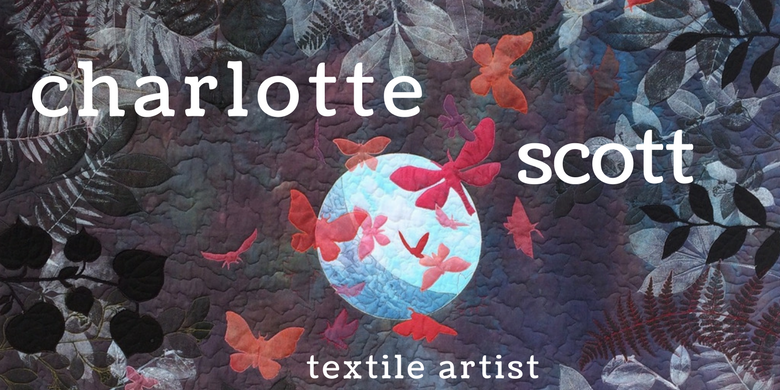 She was one of my first bloggy finds and does amazing things with softies and has a totally whacky sense of humour. Her latest Robot series is astounding. Check her out for a giggle and lots of inspiration. tiny happy. Simply stunning in her simplicity. 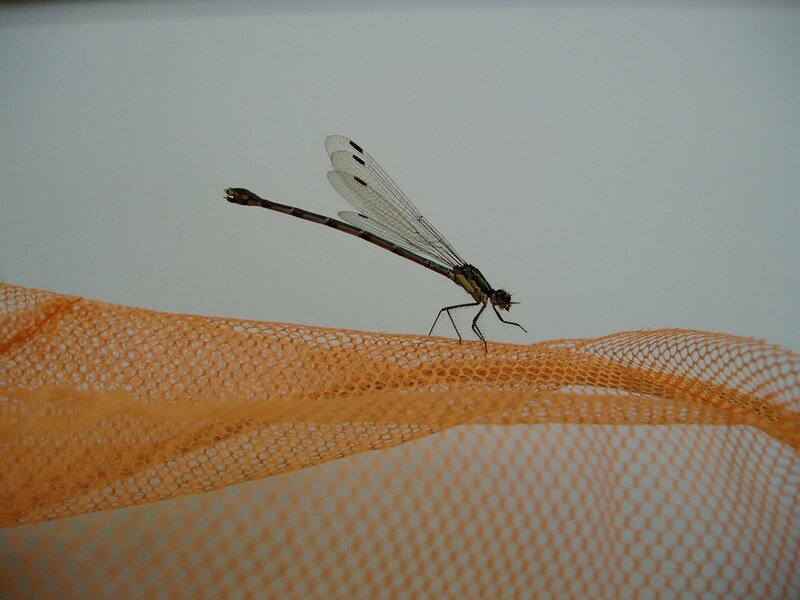 Manages to make the lovliest things from pre-loved doilies, tablecloths and scarves. 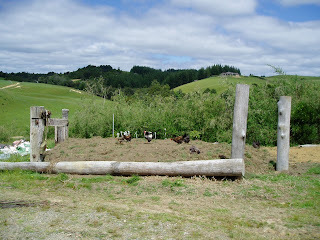 Our Wee Farm. 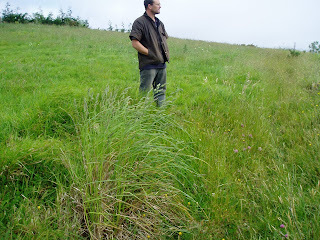 Very talented photographer, creative renovater and hard working 'wee' farmer. I admire the courage it must have taken to uproot and switch countries. And this one, Farm livin' is the life for me. I might be stretching the bounds of 'creative' here, but I reckon Lori fits under 'creative ways to live your life'. And I want other people to find this and read it - a real eye opener, go back to the first post to know more! I'm going to leave it at that. There are too many to choose from. And I've already spent a week on this post, I keep writing a little and coming back to it! I thought about giving up and passing it off as silly chain mail stuff, not worth bothering with, but I'd be fibbing to myself. Really I found it time consuming because it made me think about the blogs I do follow and why I follow them, what I want to know, what I'm learning and where I'm just time wasting. And just to finish the post off, here is a little taster for Cadi. I'm in the lucky position of doing a swap with her, quilt from me and knitted shawl from her - exciting! 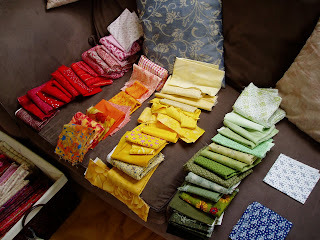 She sent me a little pack of fabrics that she wants used in the quilt so today I was digging through my stash putting together rainbows of colour! 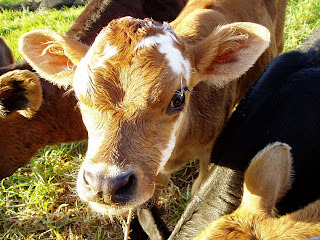 A week ago I approached the dairy farmer down the road to see if he had any bobby calves I could buy off him. 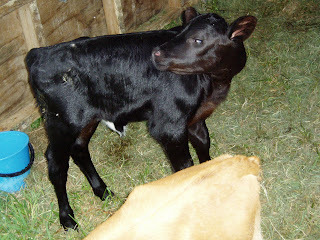 He only had two cows left to go, this little guy had just been born and when the other one went we could have that too. Unfortunately his herd mate is now part of the maternity mortality statistics and so we have only the one. He arrived today and is VERY cute. I know his eyes look devilish with the flash, but imagine liquid honey.....and so I named him Rumpelsteaksin to remind myself that I will be eating him eventually. So tomorrow morning I have to teach this feisty little guy who will be missing his mummy, how to drink from a calfeteria (aka a sugar bucket with a humongous rubber teat in the side of it). And now, to bed. Feeling a little fatigued after two 12 hour night shifts in a row. A bottled brew of gingerbeer. A big pile of chopped down gorse. Realising that this beautiful flowering flax used to be a small division just a couple of years ago, planted by me (or hubby or one of my dear friends! ), and look at it now! We are making progress. Building a calf shelter for the little bobby calves that I'm going to raise. Hot news: I have resigned so now I'll have the time (I hope) to do this sort of thing. A beautiful Sunday spent with the family.